Digital publishing is our passion. Our platform is a set of specialized tools for magazine publishers of many kinds. From magazines through comic books to news publishers and online magazines and blogs. We do provide mobile apps and PDF issues monetization tools. Constantly on the market since 2011 developing our digital publishing solutions accordingly. What is the best topic to write about and publish on mobile publishing platforms if you would like to earn additional income? What's the best platform to get started building a mobile app? What’s the best tool or software for making a digital magazine? What’s the best tool for Mobile App marketing? What’s the simplest way to sell single PDFs online? What are some of the best techniques of ASO (App Store Optimization)? What fonts should be used for Digital Magazines? What are the best App Marketing courses? How to promote a Flipboard magazine? Why is App Store Optimization (ASO) necessary? How can I get more users to my app? Is it worth investing in ASO? What should the monetization plan be for a free mobile app with no ads? What are the best ways to promote a new mobile app with no budget? What’s the best way to publish digitally? What's the easiest way to set up a website aimed at selling an ebook? How can I create an iOS app for my Wordpress website? How do I make an app which opens my mobile responsive website? What’s the best software to use for creating a digital magazine? When it comes to Lifestyle and Sport, vertical topics sell better. It means that if you fill strong with Sports it’s better to focus on some particular discipline or group of disciplines (i.e. swimming might work better than water sports in general). It depends on what kind of app you need to build. There are many very nice with lots of features app building platforms. If you need to build a mobile app for WordPress website you can use PressPad News. The app building platform just gets Android support. So currently we do support App Store and Google Play. Website. It’s the best solution for building reach and getting indexed by Google and other search engines with a mobile app (or mobile apps for different platforms) through which you can build rich and sell digital subscriptions or single issues. WordPress - is a very powerful CMS platform you can build your online magazine on. 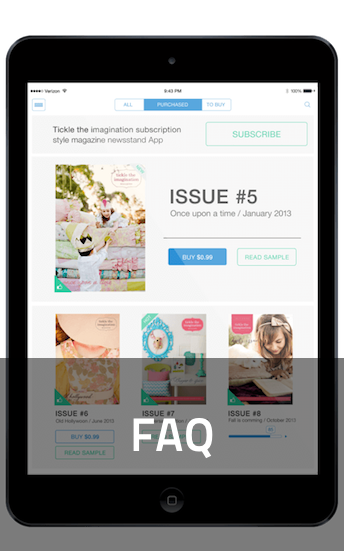 For mobile apps, PressPad provides SaaS service that builds flip-page magazines' replica based on PDF files. If selling digital issues on mobile is not your business model then you can choose Flipboard or PressPad News (if you want to have a branded mobile app) to connect your WordPress website's or RSS feed. There are many marketing tactics. Each app marketing tactics should be preceded by the App Store Optimization (ASO). If the one sees good results from the ASO (App Store Optimization) you can think about incorporating content marketing techniques to build awareness and rich for the particular app. If you want to know more about app marketing watch this digital magazine app marketing webinar. It depends on what are these PDFs all about and what kind of content do they deliver. If the PDFs contain Digital Magazines (magazine digital replicas) or comics then it is possible to utilize mobile app stores. PressPad delivers a mobile app for the publisher (or service provider). The app is free to install via app stores for everyone. Publisher uploads PDFs through his web-based panel. Each PDF is ready to sell through the in-app store. Readers can buy single editions or monthly/yearly subscriptions in app. The publisher gets also an ability to sell previously uploaded PDFs via his own web store (The new version of PDF web store is in approach) that PressPad provides to him. So he can sell on mobile and through the web (multiple distribution channels). Readers buy online, on the website and read everything they bought through the one - Publisher's - app. Even smallest changes can bring an increase in the revenue as it is shown in our App Store Optimization Report. More tips about designing a magazine can be found in our article 6 Golden Rules To Succesful Digital Magazine Design. I would recommend to start from the basics with this Definitive Guide To Digital Magazine App Marketing. In this (quite) short video, CEO of PressPad shares knowledge about app marketing. Digital Marketing Guide — Useful marketing guide for Magazine Publishers from PressPad. App Store Optimization is necessary because this is how you make your app more visible in App Store. The more visible your app is, the more installs it will have. And the more often it is being installed the higher it ranks. The higher it ranks the more visible it is. Properly maintain ASO improves search-ability if the app and it makes people more eager to install their new finding. Here is what to do App Store Optimization for your app. Yes. Mobile marketing is very important because the whole world is switching to mobile. So your clients/users/readers can be approached via mobile devices. Of course, you have to measure your traffic and analyze data because that's how you can distinguish what drives Valuable Mobile Marketing for you. 23% new installs come from general website-browsing so make sure you use smart banners and App Store badges on your sites. Around 60% apps don't have ratings so, make sure that your app has been rated several times and obtained a maximum number of stars. You can read more tips on how to Boost The Number of App Installs of Your Digital Magazine. The answer is easy - YES. App Store Optimization is all about improving the visibility of a particular app on the App Store. You can build a nice free app that catches leads. Then you can create a business model crafted around a user base your app is generating with every single install. You should read about Freemium Web Products and Services, and sales AARRR funnels. Create sales funnel and define each step. Think about the freemium model as a whole bunch of iterations of your app that enable people to buy new features or paid version. Define where your users/customers are hanging online (which social network). Ask friends to rate your app. Ask them again to write reviews. Use smart banners on your websites and blog. Use Twitter's advanced search to find early adopters that match your app. Run giveaways campaign like this one or a similar site. It depends on what you are going to publish. You can choose from magazine apps publishing or branded news apps for your blog or web magazine. Firstly, you can start creating your website, where you can direct relevant traffic to Facebook Ads or Google AdWords. It would be home base you control. You can read more about it: How to Create a Stunning Web Magazine or Blog. It would be through WordPress.com or even Shopify.com. Also, you can get advantage from using this online magazine selling tool. Using WordPress you can quite easily integrate presentation layer through built-in Themes engine, Payment/download-validation through PayPal snippets and Subscription to further updates with a MailChimp widgets or MailPoet plug-in. There are a dozen ways to get your own WordPress Website app. One of them is using PressPad News service. PressPad News builds an iOS app for your WordPress website. They’ll give you a web-based dashboard to have control over your app, check statistics and so. You’ll be able to send push notifications, use ads, and onboard your readers. This app would be an off-line mode. You can order your demo app for a free trial. You don’t need a developer account. If you want to create an app that will open a web-view for your website, don’t do it. There is a better way to go mobile with you website. You can use responsive design to create mobile friendly website (e.i. Bootstrap or Skeleton). If you have a business goal you can create a native mobile app that won’t be a website replacement but rather its extension. With mobile app you can increase readership and mobile users retention to your website (don’t forget about hosting, backend infrastructure and updating your code according to frequent iOS upgrades, calculate the cost and yearly developer account fee). You can also use tools like PressPad News (you’ll get a native mobile app with your website’s content in it: push notifications, offline mode without a developer account). You can try PressPad. It will upload your PDF file to have the digital magazine app done. Important thing is that the publisher can use their existing PDFs.